The low priced Kraus KPF-1622SN Single Lever Pull-Down Kitchen Faucet Satin Nickel is a great example of what Kraus can offer the consumer on a budget. It has a lead-free all-metal construction, offering you years of maintenance-free use. Flow control is at its best in this product thanks to its single-lever design that has just enough give to make it precise. 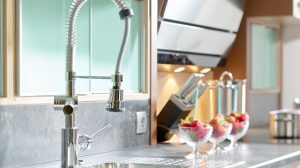 If you tend to have a lot of dishes in the sink then the high-arching swivel spout provides full access, leaving you in complete control of your kitchen. Using a tried and true design, the pull-down sprayer is held in place with secure docking and has a retractable hose with a counterweight. This unit will perform for years using rigorously tested methods. Rounding out the great features of this product is the high-performance, low-flow NEOPERL aerator, the same type used in kitchen faucets that cost twice as much. Kraus KPF-1622SN is one of the best models you can get at such a low price without missing out on important features that make it a sustainable kitchen faucet. Both finishes — satin nickel and chrome — are corrosion and rust resistant. Take comfort in knowing that whichever design you choose, it will look brand new after years of hard use. All mounting hardware is included, giving you more time to install the system and to get to know your new purchase. Previous customers report that installation took less than an hour in most modern home setups, and with little supervision. The included Kerox ceramic cartridge has been tested with 500,000 cycles, proving that it can stand the test of time without falling apart. This is an important consideration for any kitchen faucet and why Kraus tests theirs so rigorously. Hard water buildup is prevented through the use of rubber nozzles on select models, so if hard water is a problem for you, make sure to specify that you need this feature. Buyers with water softeners installed won’t need to worry about this requirement, which is a good reason to already have one installed before purchasing. Regardless of what happens, the limited lifetime warranty will protect the original purchaser from all defects. Certification for the product includes UPC, FTC, CSA, IAPMO, SCC, ADA, and others. Kraus KPF-1622SN is a fully compliant product that passes performance tests with flying colors. It has a flow rate of 1.8 GPM, which is typical of a kitchen faucet of this size. The faucet height is 14.8 inches with a spout height and reach of 8.5 and 7.1 inches, respectively. A hole size of 1.375 inches and a maximum deck thickness of 1.75 inches are required for installation. Whatever design you go with, the contemporary look will blend with both modern and traditional kitchens alike, making it an awesome choice for buyers with varied tastes. There is no spray setting on this model, and the retractable hose acts as just an extension. So the fancy pause and spray features that are common among higher-end models are not included in the Kraus KPF-1622SN. The spray head allows you to extend the faucet to other parts of the sink or beyond, but nothing more. This may be a deal-breaker for buyers accustomed to extra features, but most customers don’t notice any difference in the other applications. This is one of those situations where your mileage may vary, so consider whether you use those extra functions or not enough to warrant an alternative purchase. Since the spout swivels 360 degrees there are lots of installation options, including putting the handle in front of the system. Don’t be limited by the instruction manual — more and more customers are getting creative with their setup, opting to abandon the default setup and choose something that fits their home and style. Make the most of the flexibility of this kitchen faucet by adapting it to meet your own personal preferences. Comparing this Kraus to the Hapilife 10 Years Warranty Contemporary Single Handle Swivel Pull Out Spout is fitting since they are both low-priced kitchen faucets with simplified features. Where the Haplife product wins is that it has a multi-function spray head rather than just an extension. Consumers concerned about quality should definitely stick with the Kraus brand as it is more popular and has better customer support. The materials used in a Kraus product are expected to last for years without problems, even with the lower tier products. Although it debuted at an already low price, this model has steadily dropped in price since its arrival. There was a small sale a while back, but nothing similar is likely to be coming up in the future, including over the holidays. Stock is good for this model so if you’re on the fence about a purchase, you can take time to research other brands without worrying about it running out of stock, and that goes for both finish options. The price will probably continue to decrease in small increments as more Kraus products are released. Even with the lack of spray functions, this is an interesting product, especially considering that several other options from Kraus and other reputable makers in the same price range actually include that feature. The thing is that not everyone cares about multi-function spray heads, so for those users that are really interested in a retractable spray head, it is a good buy. It’s not a big portion of the market, but the industry caters to a lot of people regardless of whether they find this feature desirable or not. It is also true that models without those extra functions tend to have an extended life. Without small buttons or extra mechanics, it’s less of a hassle if something breaks, which can require the entire head to be repaired or replaced. In this light, single-function spray heads are more reliable. Although this product might not be for everyone, it still has a small base of users that find it a joy to use every day in their kitchen. There are a couple of better kitchen faucets available for the same price, but since this model speaks to a small base of users that don’t want all of the modern features, it holds its place in the market. Kraus KPF-1622SN is one of those items that consumers don’t realize they are searching for until they actually see it, and then they have to have it. Luckily, this won’t run out of stock anytime soon and will be readily available if you choose to go for it.